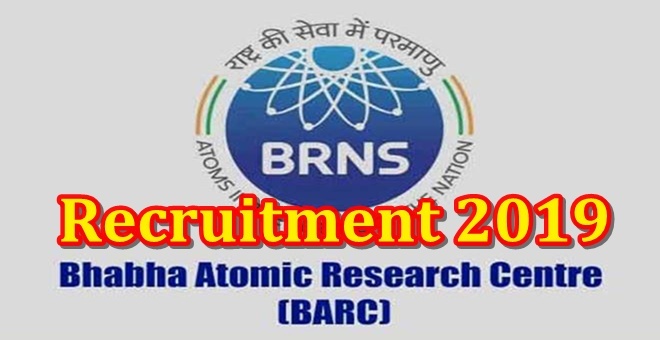 Bhabha Atomic Research Center (BARC Recruitment 2019) - 60 Application for Upper Division Clerk and Stenographer Deadline: 25 February 2019. Bhabha Atomic Research Center Recruitment 2019 (BARC Recruitment) 60 applications for Upper additional division clerk and stenographer. If you are interested in this BARC recruitment 2019 then you can apply online before February 25. BARC Recruitment 2019 Information related to job is as follows. Accredited University or equivalent degree with a total of 50% marks. Speed ​​of 80 words per minute in the transcription of matriculation or equivalent and English words and typing speed in 30 words per minute. Application fee: 100 / - for General / OBC category, no charge for SC / ST, PWD and Women category, through debit card, credit card, net banking, online examination fee. Interested candidates can apply online through 31.01.2019 to 25.02.2019 through the website http://www.barc.gov.in. All of you are requested to send this Job BARC recruitment 2019 (Bhabha Atomic Research Center Recruitment 2019) link to his friends at WhatsApp Group and Facebook or other social network and help them get good employment. Please.